---a refrain repeated several times by the father of the less than ideal American family taking this long and not very joyous Christmas ride to grandmother and grandfather's house . . .and to the edge of the familial abyss. The car is probably the one product that most drastically changed the life of Americans generally and the American family in particular. The first time I can recall seeing it materialize in the form of just a few chairs, was in Thornton Wilder's much produced one-act The Happy Journey From Trenton. The last time I saw it similarly used but to tell a quite different family story was in Paula Vogel's Pulitzer Prize winning How I Learned to Drive when it played at the same theater where her newest play, The Long Christmas Ride Home just opened. The ride Vogel takes us on this time around is very much a case of a dedicated teacher following the adventurous spirit she tries to nourish in her students in Brown University's MFA playwriting program. In deconstructing one family's image of American as apple pie togetherness on the ultimate family holiday, Vogel returns to the central prop d of How I Learned to Drive and the painful memories of her brother's death from AIDS explored in The Baltimore Waltz. It is also the outgrowth of her interest in fostering experimental theatrical techniques and acknowledging the roots of that experimental spirit. Thus The Long Christmas Ride Home combines theatrical puppetry with Japanese and contemporary theater techniques, and at the same time pays tribute to another Pulitzer Prize winner, Thornton Wilder -- most obviously Wilder's The Happy Journey From Trenton but also Our Town. Vogel's idea for telling a sad story beautifully and without the pitfalls inherent in using either real children or having adults playing children is stunningly realized through her collaboration with master puppeteer Basil Twist and by Neil Patel's simple set design and Mark McCullough's mood capturing lighting. 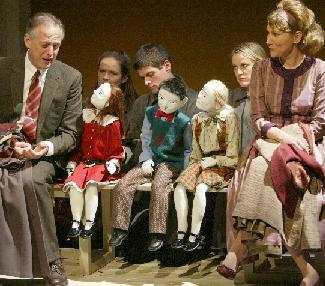 The actors have admirably mastered enough of the techniques of puppetry to handle the head movements of their Bunraku inspired almost life-sized puppet counterparts while the black gowned puppeteers crouch on the floor as if an extension of their bodies. The parents, who also double as narrators, are realistically represented by Randy Graff and Mark Bloom. About halfway through the play the puppeteer-actors burst from the chrysallis of the expressionistic "filthy Rambler" and, one at a time, bring us up to date on the young adults 12-year-old Rebecca (Catherine Kellner), 9-year-old Stephen (Will McCormack) and 7-year-old Claire (Enid Graham) have become. Vogel's version of the Hallmark card picture of Christmas as the ultimate holiday of good will and joyous celebration points to a bumpy ride from the moment the Rambler heads off to Christmas dinner at grandma and grandpa's to the angry premature ride home after a more than unpleasant quarrel. The kids squabble in the back seat and the man and woman in their parental and narrator roles fill us in on the bubbling tensions caused by his womanizing and her fantasizing about rebuilding her battered ego with a little fling of her own. We also learn that this is an intermarriage between a lapsed Catholic and a Jew who turns all the cliches about Jewish husbands on their head ("love their children, invest their money, never drink"). There's an entertaining flashback to a Christmas Eve service at the Unitarian Universalist Church they attend where a young visiting minister (Sean Palmer) gives a slide lecture (courtesy of Jan Hartley's handsome projections) intended to teach the universality of all faiths. This has the man amusingly muttering a Hebrew prayer to his wife who, as in a private joke, responds with a "Hail Mary", while Young Claire wishes they could sing Carols and Rebecca yearns for Catholic boys who "are hot." Only Stephen is enthralled with this introduction to Far Eastern culture. The holiday trip take an explosive turn at the home of the grandparents. Being walking wounded of the Great Depression, the grandparents' idea of an appropriate Christmas gift is something foraged from other people's garbage. The father's gifts are no less disturbing -- a soccer ball for the unathletic, sensitive Stephen; a delicate gold bracelet for the little girl he obviously favors over the other children which gets broken by Stephen and causes a painful scene of parental abuse which in turn ignites an equally painful blow-up between the father and grandfather. The performances, especially Graff's and Blum's, are excellent. Mark Brokaw subtly oversees the integration of the puppetry, projections and dance. The puppets are at once beautiful and eerie. The language is poetic but always clear and accessible. A solo dance choreographed by John Carrafa showcases yet another talent of the versatile Sean Palmer and, though hardly essential to the overall, adds to the play's aural and visual pleasures. The play could easily have run into a major roadblock when it makes a dramatic flashforward detour during which we see the stormy family dynamic replayed in the lives of the adult children now portrayed by the actors. Fortunately, the connection between Twist's almost human puppets and the adult actors is as clear as the transition is seamless. That said, the sisters' stories come off a bit sketchy and ordinary, while the brother's which evolves into his being the ghostly guardian watching over them is overly detailed. The puppets are so much the stars of this ride to grandmother's house and back that it's almost a relief to return to the climactic car scene when the father's repeated and pained "I can't breathe in this family" gets a redemptive turnaround as everyone not only breathes but does so "as one family and one flesh. " As in the Vineyard's last play and major hit, Avenue Q, the puppets in this play also have some X-rated scenes, this time featuring shadow puppets. But that's where the resemblance stops. The Long Chrismas Ride Home is importantly propelled forward by David Van Tieghem's Eastern flavored music performed by Luke Notary, but it's not a musical -- and, while there are some laughs (most provided by Graff and Blum), this is not a peppy entertainment but a poetic ghost story that valiantly squeezes hope out of sadness. Cast: Mark Blum, Randy Graff, Enid Graham, Catherine Kellnerm Will McCormack , and Sean Palmer. Pupeteers: Mattgew Acheson, Oliver Daltzel, Erin K. Orr, Mark Petrosino, Sarah Provost and Lake Simons. From 10/14/03 to 12/07/03 ; opening 11/04/03 . Tuesdays thru Fridays at 8 p.m.; Saturdays at 4 and 8 p.m.; Sundays at 3 p.m.
Tickets range from $20 (student rush) to $50.